Possibly in part after Rosso. 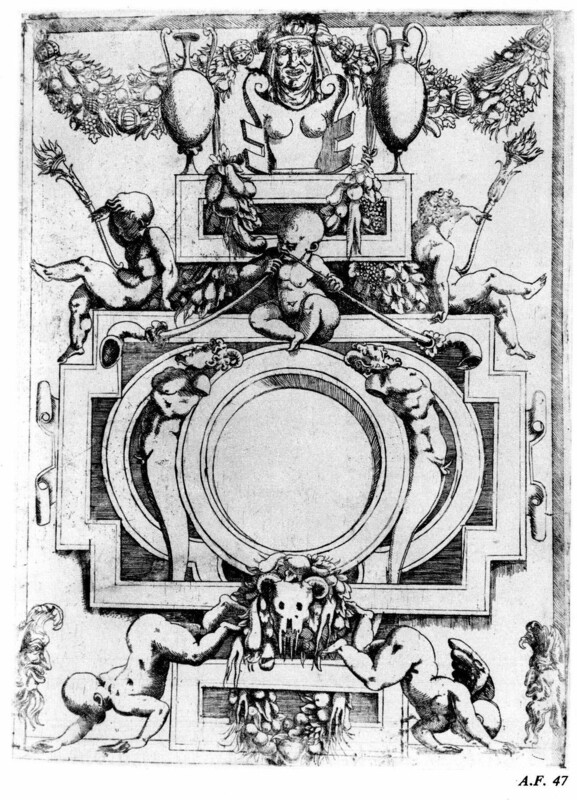 Etching by Antonio Fantuzzi, 28.9 x 22 S (Paris, Ed 8b). Herbet, II, 1896, 274 (1969, 70), 20, as Fantuzzi. Zerner, 1969, XLIV, A.F.47 (Paris), as 1542-1543. COLLECTIONS: Paris, Eb 14d; Ed 8b Rés., Vol. II, no. 57. Berliner, 1925-1926, I, Pl. 119.1 (bottom left), Text Volume, 42. Thomas, 1959, 69, Fig. 76, 70. Béguin, RdA, 1969, 105, as a variant of a decorative scheme represented also by Zerner, A.F.48 [E.85]. Adelson, 1980, 161, ns. 69, 70, Fig. 61. 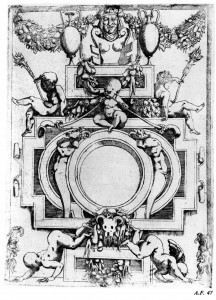 On this print and its possible relation to the lost decoration of the Small Gallery at Fontainebleau, see E.85 and L.41. COPY, PRINT: E.56,6. Du Cerceau, etching. Herbet, IV, 1900, 302 (1969, 152), V (Grands Cartouches, Second Set), 6.